This superb one bedroom, ocean front apartment is situated in the quiet fishing village of Los Abrigos, on the south coast of Tenerife. The balcony directly overlooks the sea which is approximately 30 metres away. 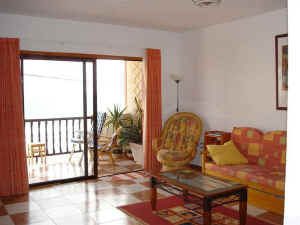 The apartment is not part of a holiday complex, but is in a residential location in a typical Canarian Village. 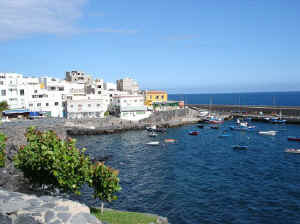 Los Abrigos is a quiet fishing village famous for its restaurants situated on the south coast of Tenerife. It has its own local beach and harbour area ideal for swimming and snorkelling. It is a rural Spanish location ideal for getting away from the tourist areas but for the complete Tenerife experience the popular resorts of Los Cristianos & Playa de Las Americas are a 15 minute drive away, with shopping, beaches and nightlife. The famous golf resorts of Golf del sur and Amarilla Golf are within 20 min. walk and the international surfing centre of El Medano is 10 min. drive away, as is the Tenerife South Airport. The apartment has a large spacious lounge with an adjoining kitchen and dining area. Satellite TV is provided (including English channels, but not BBC1 etc. ), as is a video and DVD player, HI FI and CD player. A number of CDs, DVDs and videos are available for viewing and there is a small library of reading books. There are 2 sofa beds and and an extra foldaway Z bed, extending the accommodation to a maximum of 5 persons. The balcony directly overlooks the sea and is fully equipped with patio chairs, dining table and sun shade. In the winter, the sun shines onto the balcony from early in the morning until the spectacular sunsets in the evening. For families with very young children, there is a travel cot and a high chair. There is a fully equipped kitchen with hob, oven and microwave, together with a large breakfast bar area. There is also a dining area with a dining table and chairs. Large double bedroom with king-size bed fitted wardrobes, twin pine chests of drawers and patio doors out into the veranda-laundry room, where there is a washing machine/spin dryer. There is a smart modern luxury bathroom with shower and bidet. Changeover day is flexible. Longer periods can be booked on a pro rata basis.